Need a festive appetizer to your next party? For a healthier take (no more deep-fried hors d'oeuvres! ), try this recipe for Leek and Broccoli Tartlets with Pancetta. At only 37 calories per serving, this starter looks pretty on a plate, and takes a mere 30 minutes to make. It has phyllo shells for crunch, and a bit of pancetta for that cured-meat flavor. The recipe also includes ingredients like broccoli rabe, which is packed with vitamins A and C; leeks, which are low-calorie and full of powerful antioxidants; and yellow onions, which are good for the nerves and cardiovascular system. 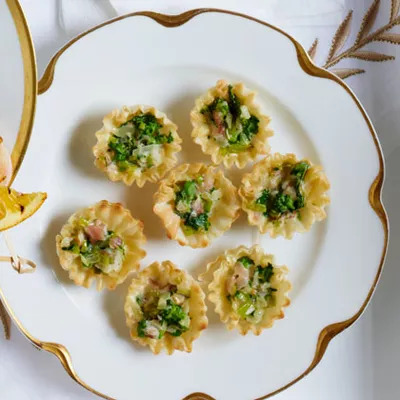 To save time making this appetizer, look for pre-made miniature phyllo shells in the freezer section of your local supermarket.